From banking, to opening up a democratic school in Singapore, Kezia Thamrin’s on a mission, and we’ve got to hear her out. After 4 years of banking, Kezia decided to pursue her passions in Education. 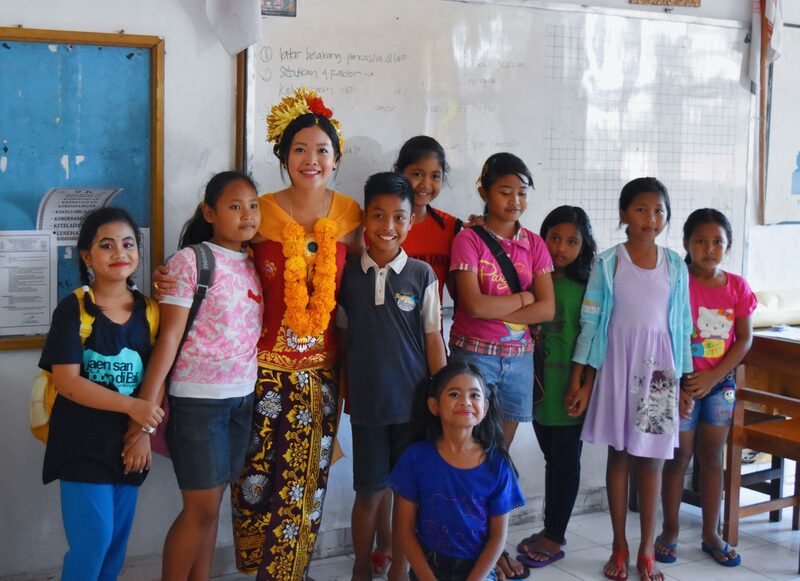 Last year, she volunteered to teach English to Balinese children in Ubud, before continuing her work at a community centre in Singapore to offer free tuition to children. Some of the children were either anxious, stressed out, or even depressed due to the pressures they faced to earn the best grades and get into the best schools. “Somewhere along the way, we’ve lost our way and have forgotten what education is about – the students,” says Kezia Thamrin (Founder & Director of Reverie Enterprise). Kezia is looking to disrupt the ecosystem of conventional schools in Southeast Asia by Sparking an Education Revolution with something we’ll all be hearing very soon of – Alternative Education. Thank you for taking the time, Kezia. What does Alternative Education mean to you? Alternative education means moving away from grades, listening to our students and what they want to learn, developing a holistic child (that includes the soft skills too!) and honing their 21st century skills. Go outside of the classroom, learn how to garden, or work on a project that helps the local community! Our objective as educators is to create a conducive environment for children to pursue their passions and interests in their own path. Children are natural learners and love to learn, so the learning will happen naturally and inevitably. And what was it that ignited your passion in Alternative Education? Sir Ken Robinson’s TED talk made me realise that there was a whole realm of Alternative Education that I never knew about – that there were options outside of conventional schools. I started researching about alternative education and visiting alternative schools in the US to learn more and see what aspects of each school could be brought back to Asia. Blue Man Group, who founded The Blue School, interestingly pointed out how kids are filled with laughter in kindergarten, but that laughter softens as they reach college. Why would you say that’s the case? School has become so serious that kids don’t find learning to be fun or enjoyable anymore. In many countries, the pressure to perform comes as early as elementary school. In some countries, by the time the kids turn 12, they have to cram for national examinations and worry about the next step in their education. It’s unfortunate to see the children’s passion for learning fade out at such a young age. We need to help our kids find the joy in learning once again. What’s replaced the joy in learning in kids? The fear of failure. Our society leads us to believe that success means a high paying job, an ivy league school, or the most expensive car or house, and such success is the only way to happiness. As a result, we produce highly anxious and stressed out fresh graduates who believe that if they do not achieve these goals, it means that they are not “good enough” or are failures. Success is extremely subjective, and failing is okay. We need to embrace failure-based learning because failure strengthens us and pushes us to improve. That’s what we need to be ingraining into our kids! We hear you’re opening a school yourself! Tell us about it! I am planning to open a democratic school in Singapore, with a democratically governed setting whereby students are trusted to take ownership and responsibility for their own learning and for the school community. The curriculum will revolve around the development of the children’s mind, body, soul, and the environment. Students will spend a majority of school time working on projects and teachers will help curate projects based on what the students are interested in or curious about. There will be no grades or exams; instead, teachers and peers will provide kind, specific and helpful feedback to one another. There will also be weekly field trips to various places , such as museums, factories, historical site or gardens, where the students can experience immersive and experiential learning. The school will have a partnership with a sustainable farm close by so the students learn how to feed themselves and tend to plants (gardening) and animals (e.g. taking care of chickens). The idea is for the children to build a connection to the natural world and become educated on sustainable and healthy living. Every day, there will be mindful minutes where students take 15 minutes after lunch to have “quiet time” and reflect. In such an environment, there will be room for the children to develop and hone their soft skills – creativity, negotiation, learning how to have difficult conversations and awareness, etc. What is it that you hope to achieve by this event – Sparking an Education Revolution? My goal is to build a community of early adopters of alternative education amongst parents and educators. I would like the attendees to learn more about options outside of the traditional school. The event will be a safe place where questions can be asked and discussions had on our concerns and inquiries on alternative education. I believe Singapore is ready for a change – they’re just not aware of the options available. Kezia’s hosting a discussion at The Working Capitol on Monday, 26th November, to showcase a couple of progressive democratic schools who are doing things above and beyond the conventional and traditional approaches to education. They will be livestreaming with the Founder & Partner of The Wish School and Pono NYC for a live Q&A session. It will be a moderated open-floor discussion to discuss what alternative learning is and the different approaches that are currently being executed in schools around the world. RSVP at twc.sg/edurevolution, and let’s Spark an Education Revolution together!